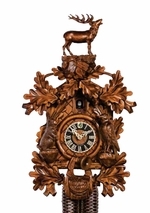 This charming and inexpensive cuckoo clock has leaves and a bird that are hand carved from solid Linden wood. The when the clock strikes the hour or half-hour, the door opens, a cuckoo appears and calls along with the clock’s gong strike. This special model has authentic wooden weights, wooden hands, wooden numbers, and a wooden cuckoo bird! Even the packaging has old-world charm, as only paper is used. The factory packing is all made with recycled materials. This clock makes a great gift for the young and old alike.